In a previous post, Nakao-san and Shingijutsu-Kaizen, I described some of what I learned observing Mr. Nakao lead kaizen for several days at a company in Connecticut. As I reflect back on that, as well as my previous experiences as a team member and team leader in Shingijutsu kaizens, I think about the different approaches to Lean transformation. There are many consultants and trainers who teach kaizen and provide Lean transformation support. Often, the specific approach they use is proprietary. Some organizations, such as the Lean Enterprise Institute, identify “crucial steps” for getting started on their web site. So, as a thinking exercise, I though it would be interesting to compare LEI’s “action plan” to what I perceive to be Shingijutsu’s action plan based on my personal experience and nothing more. The table below shows what I found. Please, again, note that what is contained on the right side of the table is based on my personal experience, and not on any documentation, communication, or formal or informal discussion with Shingijutsu USA. 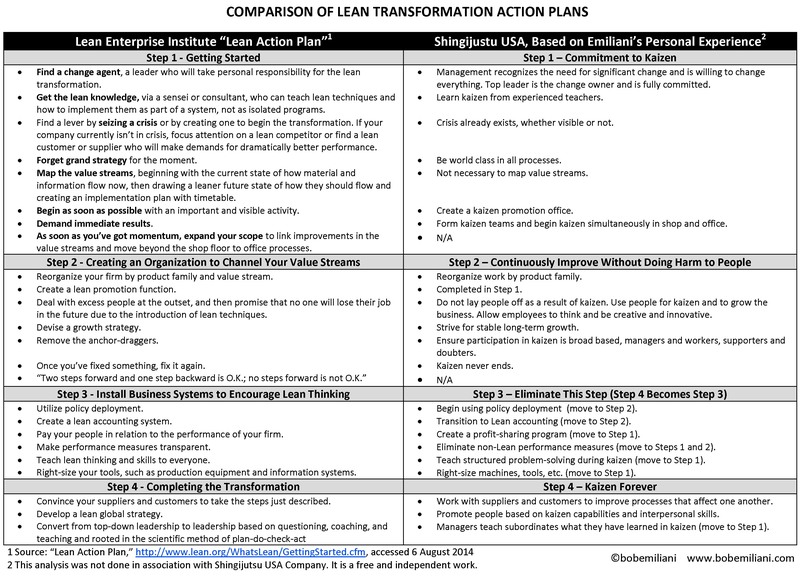 As you can see, there is significant differences in Lean transformation action plans. However, we must recognize the limitations of this simple analysis. The Lean Enterprise Institute is trying to provide a helpful action plan for Lean transformation to interested persons, some of whom will follow it because LEI is an influential organization. Yet, in my view, it is a faulty, if not wrong approach. Shingijutsu’s approach to Lean transformation has kaizen as its core, yet it offers several other services that are also necessary to improve flow in the shop and office (see Shingijutsu-Kaizen Conference summaries for Day 1 and Day 2). At minimum, this simple analysis helps people who are unfamiliar with Shingijutsu grasp their approach to the beginning activities that are necessary to transform an organization. In addition, you can see that there is more than one approach to Lean transformation, and they while they share some similarities, there are also significant differences. Great insight provided, as usual. The contrasts and consensus are both instructive. It seems you have highlighted the greatest contrast first: the source of transformation leadership. Shall we term this the Art Byrne contrast? That said, I am aware of a number of transformation efforts in which Shingijutsu (or one of the Shingijutsus) played a substantial role and which receded unto death, probably because of the Art Byrne contrast. How does Shingijutsu gauge the commitment of the execs and the board of directors? Do they walk away from insufficiently high levels of commitment these days? Thank you. Yes, you could term Step 1 (item 1) as “the Art Byrne contrast.” Indeed, Shingijutsu’s work is often undone by leaders who later turn out to have been lacking commitment. I do not know exactly how Shingijutsu gauges the commitment of top execs or the board, or what their walk-away criteria is. Here is what I know: Normally, executive commitment is expressed by words alone. Usually, that is not good enough. And they typically receive a small dose of classroom training in Lean that fools them into thinking they know Lean. But, sometimes this is enough. Every once in a while a top executive is so sick of the ways things are done that he or she gives everyone unobstructed freedom to make changes top-to-bottom. That can work very well. “The Art Byrne contrast” differs substantially in that the top leader personally participates in kaizen to learn Lean principles and practices firsthand. This is rare. It works better because the pace of change is faster and because everyone knows the leaders is committed. There is zero ambiguity. As a side comment, the risk in awareness training that you mention i.e., that shallow learning can be self-defeating, can be traced – at least in part – to Dunning-Kruger overconfidence. If I understand the main point of D-K overconfidence it is that the less you know about something the greater the gap between what you think you know and what there is to be known. In the case of transformation, we exit our awareness training thinking we grasp the task before us without actually having a clue. Then, when we charge into action and confront failure*, we assume that the transition goal is flawed because – after all – it can’t be our incompetence: we knew how to do it right, right? Here’s the “training” takeaway: if your performance isn’t validly assessed, if you don’t sufficiently practice before and after assessment, you are unlikely to have skills (cognitive or otherwise) that you did not have before the instructional intervention. *Failure in transformation is a feature not a bug. It provides leadership the opportunity to humbly, patiently, persistently grasp problems and to demonstrate proper problem solving and the will to transform.